The first glance itself manifests that the Motorola RAZR i XT890 is neatly constructed and looks sleek. The chassis is composed of a relatively slim 122.5 by 60.9 by 8.3-millimeter (length, width, depth) frame weighing 126 grams. These dimensions are enviable considering that the phone embeds a sizeable screen. Solidity is furnished thanks to the largely aluminum components that make the phone sturdy and free of discernible squeaks. Further, the back panel is covered by Motorola’s innovative Kevlar scratch-resistant layer imparting increased ruggedness. The 4.3-inch display is the dominant design aspect. The screen comprises a capacitive multi-touch LCD touchscreen harnessing the Super AMOLED technology and a top resolution of 960 by 540 pixels. Furthermore, the display has a density of 256 pixels per inch and supports 16 million colors. All these features assure vibrant colors, bright visuals, and sharp detailing albeit with some disappointing white contrasts. The sheathing of Corning Gorilla Glass 2, the presence of a very thin bezel, and good overall viewing angles also strengthen the screen and viewing experience. The screen encompasses a VGA camera over it and 3 touch-receptive navigational buttons below. The Motorola RAZR i XT890 will be available in white and black shades. As stated earlier, the Motorola RAZR i XT890 is outfitted with an Intel chipset with hyper threading knowhow – a rarity for a full-fledged Android Smartphone. This technology, along with embedded 1GB of RAM, lends potency to the 2.0 GHz single core Atom processor resulting in an impressively fast and versatile machine with fine multitasking faculties. The smartphone exudes excellent network capabilities – it supports quad-band GSM as also quad-band 3G, the latter at speeds up to 21 megabits per second. As a consequence, phone calling is a facile affair with heightened clarity and connectivity. The built-in HTML 5 (Chrome) web browser too, as a result, assures breezy surfing and downloads facilities. The inbuilt Android Ice Cream Sandwich operating system, with its smooth running and suite of applications, elevates the user experience. A further bonus is the ability to upgrade to the newest Android Jelly Bean adaptation. The Motorola RAZR i XT890 provides an 8-GB internal storage that is expandable to 32 GB by means of the included memory card slot. The high-powered 2000 mAh Li-Ion battery furnishes close to 20 hours of talk time on a single charge. Sadly, though, the battery cannot be replaced by the user. The Motorola RAZR i XT890 is armed with a competent 8-megapixel rear camera with LED flash and autofocus abilities. Thanks to a maximum resolution of 3264 by 2448 pixels, the camera generates high-quality photographs though with considerable shutter sound. The numerous settings include geo-tagging, face discovery, image steadiness control, and high dynamic range imaging. The camcorder function can generate 1080-pixel movies at 30 frames per second. There is significant video codec backing too. 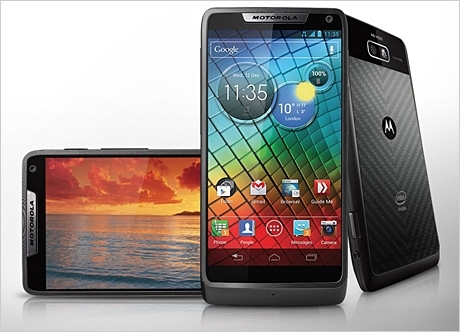 Given its all-round feature set, the Motorola RAZR i XT890 should prove a hit with all Smartphone enthusiasts.